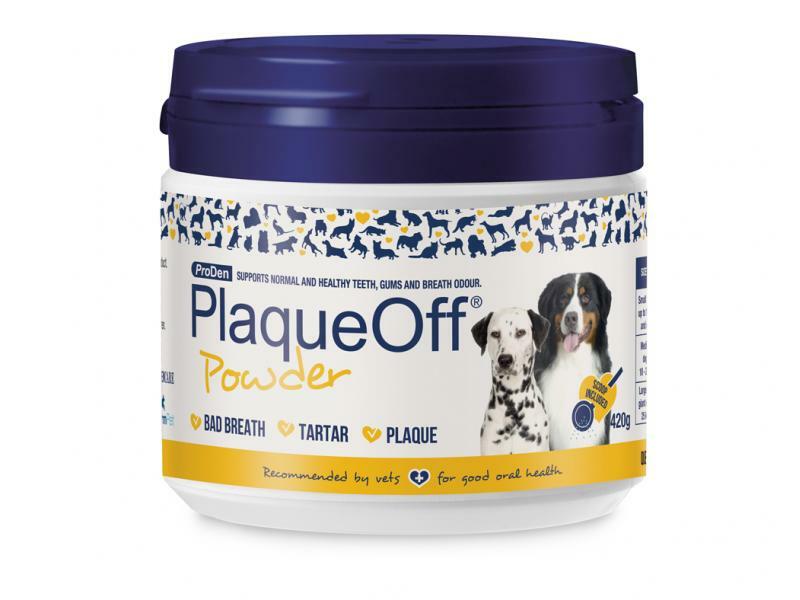 A natural and beneficial dental cleaning product, suitable for daily use to help discourage the build-up of plaque and tartar, thereby safeguarding your pet's mouth. Contains natural iodine seaweed to whiten teeth and promote healthy looking gums. The original formula is suitable for all animals but generally used in dogs. Now available is Plaque Off Cat! 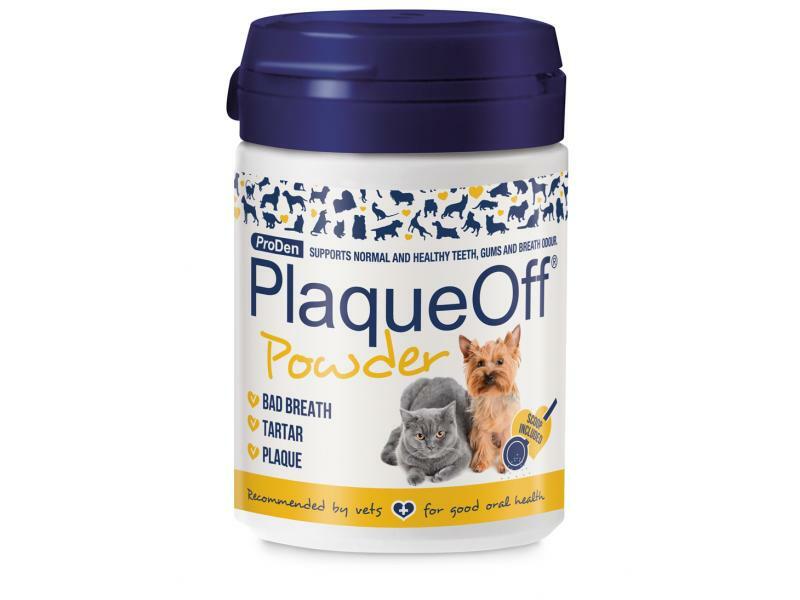 Similar to the original Plaque Off for Dogs and Cats, Plaque Off Cat also contains Brewer's Yeast which is an ingredient cats love. 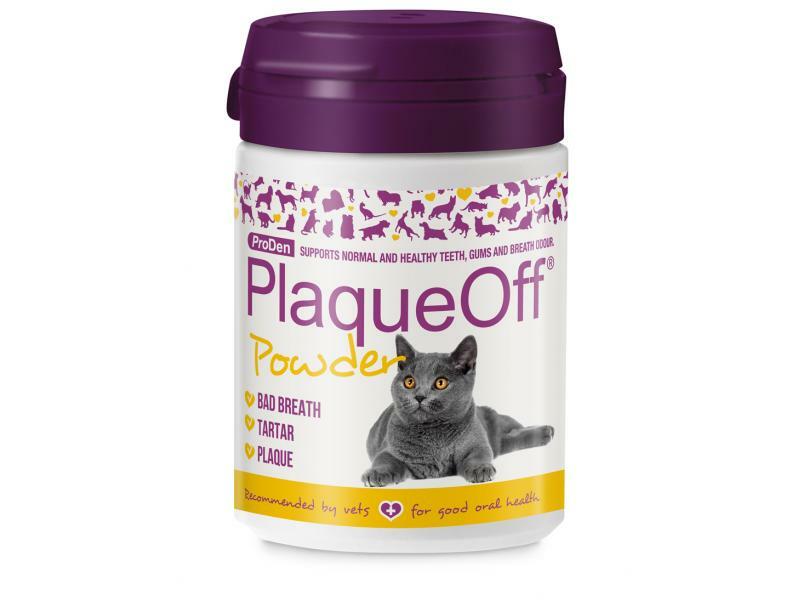 Cats generally have a more discerning palate, so this extra addition is made to boost the palatability of this product, and through testing it was seen that 100% of cat critics accepted Plaque Off Cat. Improvements can be seen in as little as 3 - 8 weeks of use. 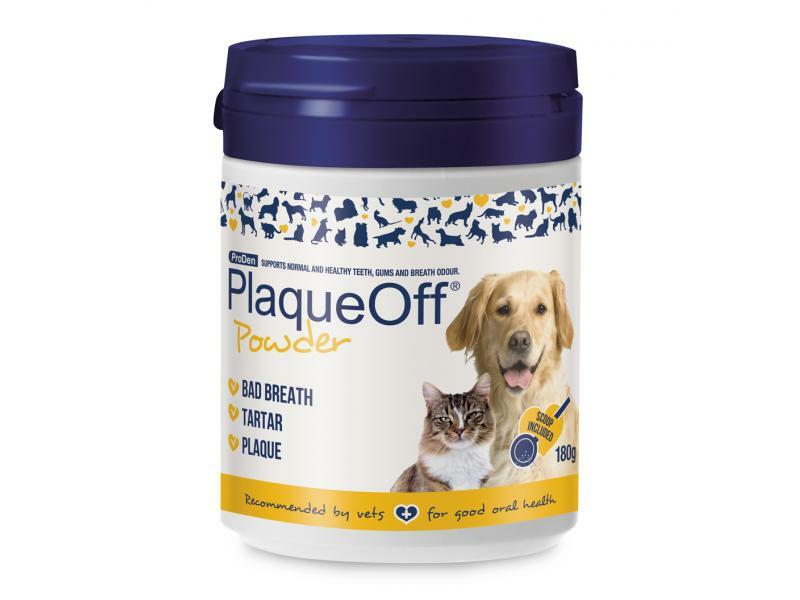 To give Plaque Off simply sprinkle the following amount on your pet's dry or wet food. The following recommendations show the guidelines for the amount to feed per day. Specially Selected Seaweed (D0170), Brewer's Yeast. Below are some recent questions we've received regarding Plaque Off for Dogs and Cats, including answers from our team. My dogs get on with brushing their teeth, however I have been thinking of using Plaque Off as well. Is it ok to brush with a Dog toothpaste too? You can still brush their teeth while using plaque off, it will not do any harm at all. Where is this product origin? Can you add Plaque Off to drinking water instead of food? Hi Valerie, unfortunately I don't think the product will be effective if added to water but if you'd prefer a water additive, Genitrix Dentagen Aqua is perfectly suited and for a dog under 12kg, a bottle will last around 50 days when used daily. Does plaque off remove plaque? I have 4 cats, my 2 females, both 7, have developed plaque on their back teeth. will plaque off help remove existing plaque or just prevent further build up? I wonder what other ingredients are used except see weed or brewer's yeast in this product. or only them? The only ingredients listed are a particular type of seaweed and brewer's yeast. Can I use this on a five month old puppy? Yes, this product is safe for a 5 month old puppy. Is it okay to feed this to a dog with renal failure? My dog is old and is at the initial stage of chronic renal failure (creatine level at 1.9 with all other figures within the normal range). Is it okay for him to have this? This product is likely to be beneficial to an older dog, even with the early signs of CRF. Anything you can do to physically keep the teeth clean too will be a good idea (brushing is best, but often not practicable in an older dog which is not used to it). Interested in this dental product for my dog but she had pancreatitis twice last year and is strictly on royal canine sensitivity control food. Is this product suitable for her? Don't want to use anything that may affect her pancreas. Pancreatitis is an unpredictable condition which is not fully understood, although there are certain risk factors which are known, such as obesity and a high fat diet. Plaque Off however would be very unlikely to have any effect at all on pancreatitis so it should be fine to use. Could product worsen atopic symptoms? My dog was diagnosed with atopy and this is treated with Malaseb shampoo when condition flares. I have started to add Plaque Off to her food recently and wonder if this could be a contraindication. There should not be any form of adverse interaction between the products you are using and the condition of atopy. You can go on using them, though the Malaseb does not treat the atopy itself, just any secondary skin infections.